An over-35s cup final might not seem like a matter of pressing concern for the head of a national football association. But there’s a good reason why it’s occupying the attention of Scottish FA chief executive Ian Maxwell - he’s playing in it. 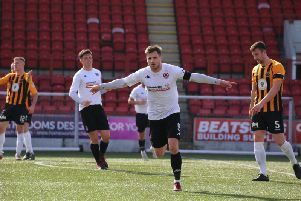 The 43-year-old is part of the Cumbernauld Colts Over-35s team who booked their place in the Scottish Cup final with a 4-2 win over Stenhousemuir at Dalziel Park in Motherwell on Friday night. They will now face holders Possil YM in the final at the Excelsior Stadium next Friday, October 12, kick-off 7.30pm. Stenhousemuir started the stronger, with good possession and forcing the Colts defence into early action. But pushing their back line high up the park allowed Colts to get in behind and make good use of their pace on the break. The breakthrough came for Colts in the 13th minute after David Rowson drove through the middle before laying the ball off to Gordon Moffat who forced the keeper into a good save. The rebound fell to Paul Finnigan whose shot was also saved by the keeper before it broke to Stuart Carslaw who scored from close range. The remainder of the half was fairly even and Colts were still ahead at the break. But within a minute of the start of the second half, Stenhousemuir equalised from a long ball, the bounce deceiving the Colts defenders and falling to the Stenhousemuir forward who tucked the ball into the far corner. But Colts hit back immediately and Carslaw got his second with a fantastic looping shot over the keeper from just outside the box. And on 65 minutes it was 3-1 as the ball was played left to Kevin McKendry who spotted the keeper off his line and, from 30 yards, drilled a great effort into the far corner. Colts were creating the better chances and could have gone further ahead when a Grant Carr header came back off the bar. But with 10 minutes to go Stenhousemuir got a goal back, with the ball breaking to their forward on the left hand side of the box and he scored with a strong, low effort. From then Stenhousemuir poured forward in search of an equaliser, but that left space in behind for Colts to exploit. And they sealed their place in the final when Gavin Forsyth drove forward before passing to Carslaw and his perfect pass found Finnigan who had made a great run down the right side. From just outside the Stenhousemuir box, he took one touch then struck the ball past the keeper into the far corner. Colts: Stuart Kirkwood, Craig Logan, Mario Pacitti, Ian Maxwell, David Rowson, Kevin McKendry, Paul Finnigan, Stephen Kerr, Gavin Forsyth, Stuart Carslaw, Gordon Moffat. Subs: Paul Harris, James Orr, James Logan, Gary Grantham, Grant Carr.